Crown Point Press’s aquatint box is a study 145 x 50 x 64½” plywood construction. It easily holds our largest plate size, 36×45″. You can use these plans to build a box like ours or use them as a guide for building a box that suits your needs and studio size. 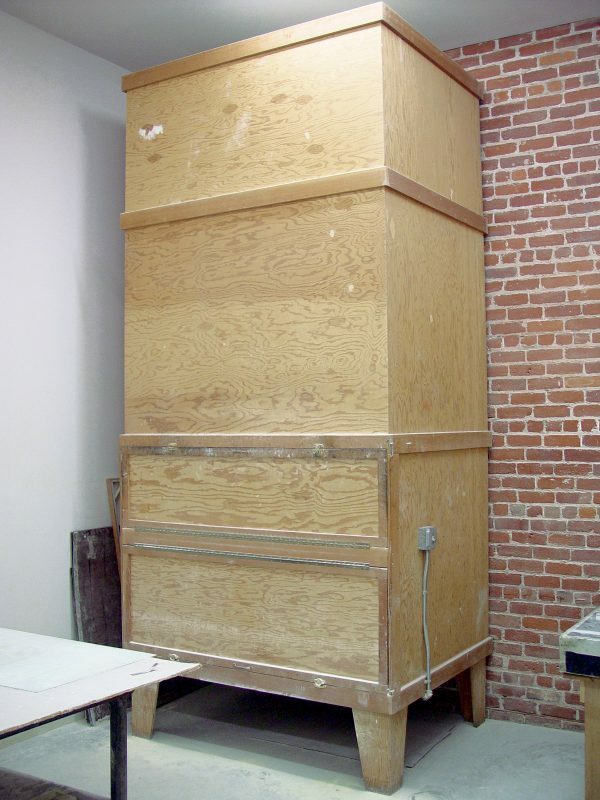 A tall box, like this one, will allow you more control over the density of the aquatint ground though the box could be made shorter if needed. Our board for holding the plate while moving it in and out of the box is a light, wood frame with a piece of sturdy cardboard stapled to the top. This construction keeps it light and easy to handle. On one end is a dowel roller that allows the board to easily roll in and out of the box. We use this for our large plates or multiple plates. However, its size requires two people to take it in and out of the box. Alternatively you can use any sturdy board that is larger than the size of your plate. The box has two hinged openings. The top door opens downward and allows access to the slatted surface on the interior of the box. From here you can drop the rosin into the lower portion on the box through the slats and slip your plate on its board into and out of the box. The lower door opens upward and there is small hook and eye to hold the door open. This allows access to the lower portion of the box to clean out old rosin powder. The interior platform of the box is made of ¾” narrow wooden slats that are spaced 3 ½”apart. These slats need to be spaced far enough apart to allow the rosin to move freely through the box when the fan is turned on. The interior edges of the door are lined with weather stripping, which avoids dust from escaping from the box when it is use.